Press the mixture into the bottom of a 9×13 inch pan. Refrigerate for one hour. 4 T peppermint schnapps (The clear variety. If you use Creme de Menthe, your filling will be green. Which is also pretty, but not what I was going for here). Beat together and spread over the first layer. Refrigerate until set (at least 30 minutes). Melt 1/2 cup butter and 2 cups chocolate chips together. Mix, and spread over the second layer. If desired, melt some red candy melts and dollop the red chocolate on top of the white. 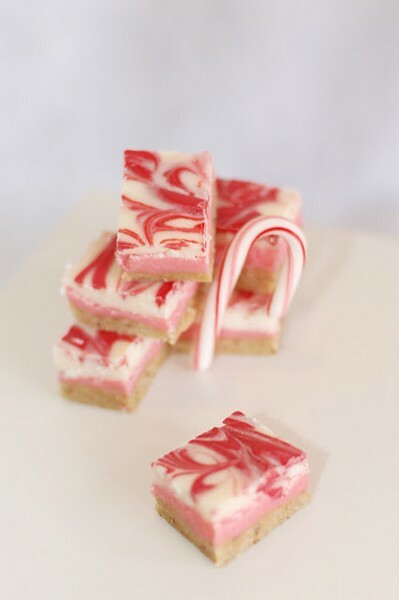 While both the red and the white chocolates are still warm, use a toothpick to swirl the red and white chocolate together to create a marbleized effect. Cut into small bars, and take care not to touch the top of the bars when cutting to avoid fingerprints. Store in the refrigerator.